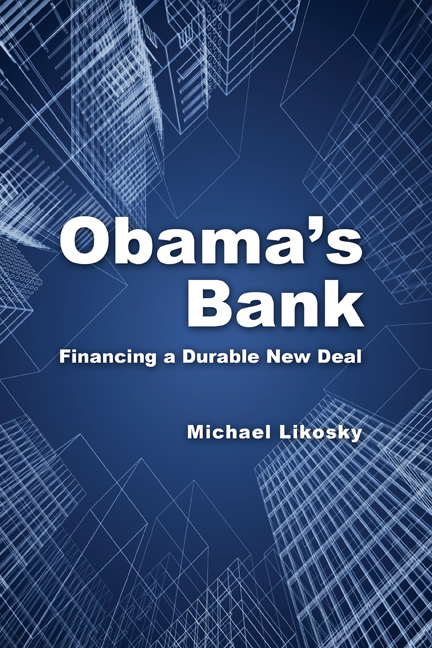 Michael Likosky is author of the book Obama's Bank (2010) and is a Fellow at NYU's Institute for Public Knowledge and the Center for State Innovation. He is an expert to the United Nations Conference on Trade and Development, a member the OECD's Working Group on Infrastructure and Extractives in Africa, and also a member of the American Society of Civil Engineers Task Force on Sustainable Development. Likosky has a doctorate from the Law Faculty of Oxford University and has been a tenured law professor at the School of Oriental and African Studies, University of London. He has also been Global Crystal Eastman Research Fellow at NYU and Markle Foundation Fellow at Oxford University and held visiting posts at University of Wisconsin Law School, Fordham Law School, and University of Bonn. Likosky has published four books: Law, Infrastructure, and Human Rights (2006), The Silicon Empire (Ashgate 2005), Privatizing Development( Martinus Nijhoff 2005), and Transnational Legal Processes (Butterworths 2002). He has twice contributed to the Oxford Amnesty Lectures and has advised the United Nations, the Ford Foundation, the New Reflection on Governance, NGOs, and major TV broadcasters.